A report on on Saturday reveals Apple's new A6 processor is actually the company's first attempt at designing a custom ARMv7 core, possibly debunking earlier claims that the silicon was using ARM's A9 or A15 Cortex designs. When Apple unveiled the iPhone 5 on Wednesday, not much divulged in the way of technical specifications, including the exact nature and build of the new A6 processor powering the device. Some, including the well-versed Anand Shimpi from AnandTech, speculated that the chip was using ARM Cortex A15 processor cores, the next-generation of ARM architecture that has yet to be seen in a consumer device. In a follow-up report, Shimpi has reportedly unearthed fresh evidence to support the idea that the A6 is "first Apple SoC to use its own ARMv7 based processor design." He goes on to say the CPU core, or cores, are not based on ARM's A9 or A15 designs, but "are something of Apple's own creation." "It turns out I was wrong. But pleasantly surprised," Shimpi writes. In coming to the conclusion that Apple custom designed the SoC's core, Shimpi whittled down the possibilities by delving into Apple's Xcode 4.5 development toolkit, comparing and contrasting certain features. He notes the newest version of Xcode dropped support for the ARMv6 instruction set architecture (ISA) used by the ARM11 core in Apple's original iPhone and second-generation iPhone 3G, while keeping support for the ARMv7 ISA used by current ARM cores. 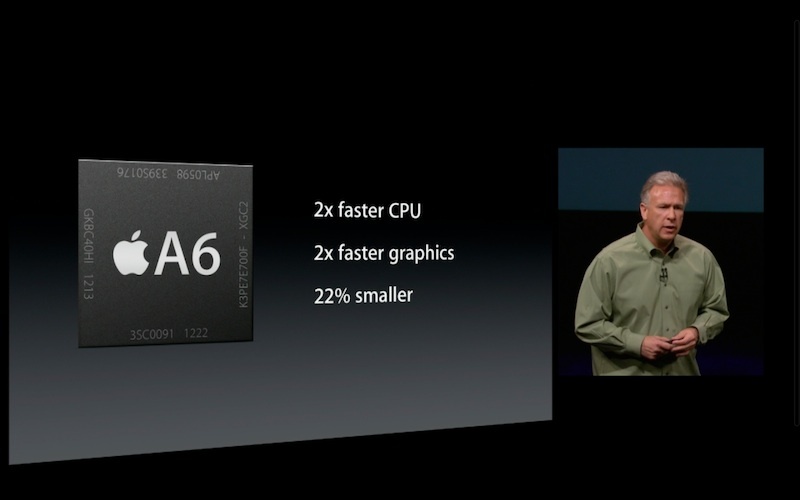 The software also added support for a new architecture designed to integrate with the A6's ARMv7s. Shimpi goes into the technicalities associated with using the various ARM cores, including which compilers offer certain VFP version support, and came to the conclusion that Apple decided to go with either ARM's Cortex A9 or Cortex A15. "For unpublishable reasons, I knew the A6 SoC wasn't based on ARM's Cortex A9, but I immediately assumed that the only other option was the Cortex A15," he said. "I foolishly cast aside the other major possibility: an Apple developed ARMv7 processor core." Giving further clues to a custom-built core is Apple's claim that the A6 offers twice the performance of last year's A5 SoC with added bonus of extended battery life, a feat that cannot be accomplished by simply moving to Samsung's 32nm process. Samsung is responsible for the fabrication of the A-series processors, not the chips' design. As for the A6 GPU, Shimpi believes Apple is using a higher clocked PowerVR SGX 543MP3 unit with a two 32-bit LPDDR2 memory interface. While it is still unclear how many cores the A6 employs, a more detailed view of the processor's internal structure should be revealed next week when the iPhone 5 hits store shelves.